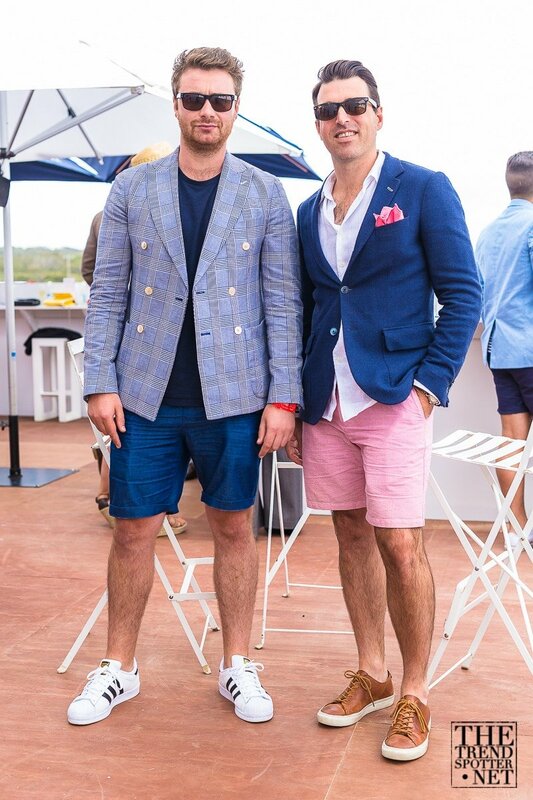 It is the much anticipated event that heralds the start of the Melbourne social year, and this year’s Jeep Portsea Polo shows that the event has come into full maturity. Locals talk of time when sandals, thongs, simple tees, linen shifts and simple picnics served from the boot of one’s Rolls or Benz was the order of the day but that all seems to have dissipated as a long gone memory. Jeep Portsea Polo is now a playground of the society set, where towering edifices rather than simple marquees line the polo field and and the fashionable ‘Beau Monde’ congregate laden in designer apparel and accessories arriving stylishly in a calvacade of limousines, boats and even for the ultra glamourous, helicopters. 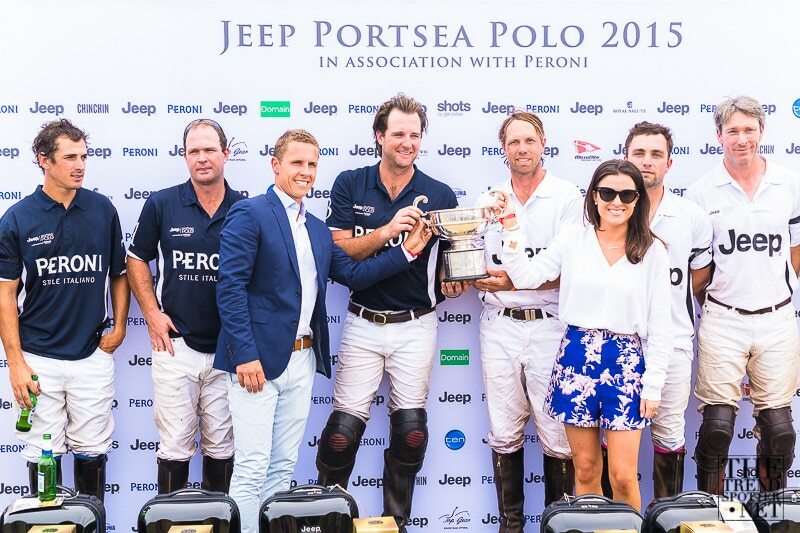 This year marked an important milestone for TheTrendSpotter team as our own Dasha and Colin Gold were named the very first Official Bloggers for the Jeep Portsea Polo. A role Dasha and Colin were honoured to fulfill and which they did in their inimitable style. As always, TheTrendSpotter team, in 2015, renews its commitment to our loyal following to bring you the latest in trends, fashion and lifestyle news and the hot happenings of the social calendar both here and internationally. Much of the social activity as well as the round of important networking centered around the exclusive enclaves of the Jeep and Peroni Marquees. Those not invited into either marquees hovered for a chance entree or a glimpse of the endless parade of sartorial style that progressed in both. 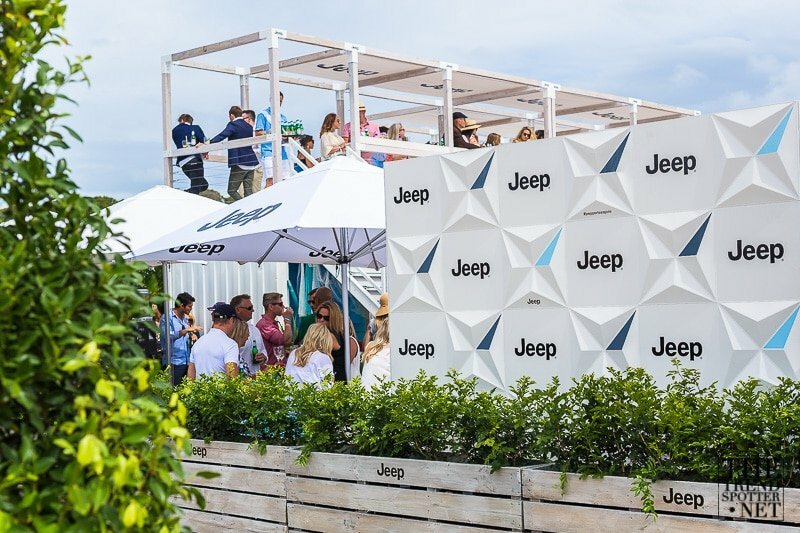 Jeep, the naming sponsors of Portsea Polo entertained their guests in a Hamptons styled setting with their marquee featuring a second storey viewing deck. Guests sipped on endless cocktails and Laurent Perrier whilst nourishing themselves from an abundant selection of tasty morsels overseen by renowned food connoisseur and Masterchef judge, Matt Preston. Jeep’s Hampton style marquee with viewing deck. Judy Romano, whose publicity and events firm, Romano Beck, oversaw proceedings, confided with TheTrendSpotter of how happy she was with the day’s proceedings. “We have gathered the best guests, the best food and and everyone is having the best time and the weather has been kind. The best of the best,” beamed Romano before being kidnapped by a flood of air-kissing acquaintances. Amongst Jeeps guests, was Lady Susan Renouf making a much welcome return to the social scene. Renouf was accompanied by friends and her much admired daughter, Anne Peacock. Star soccer player Harry Kewell was seen in tete-a-tete with Neighbours starlet, Olympia Valance. Garnering much excitement were part of the cast of hit reality show, The Real Housewives of Melbourne. Gossiping and chattering with fellow Jeep guests were Lydia Schiavello, Janet Roach and newcomers for the second season, Gamble Breaux and Pettifleur Berenger. 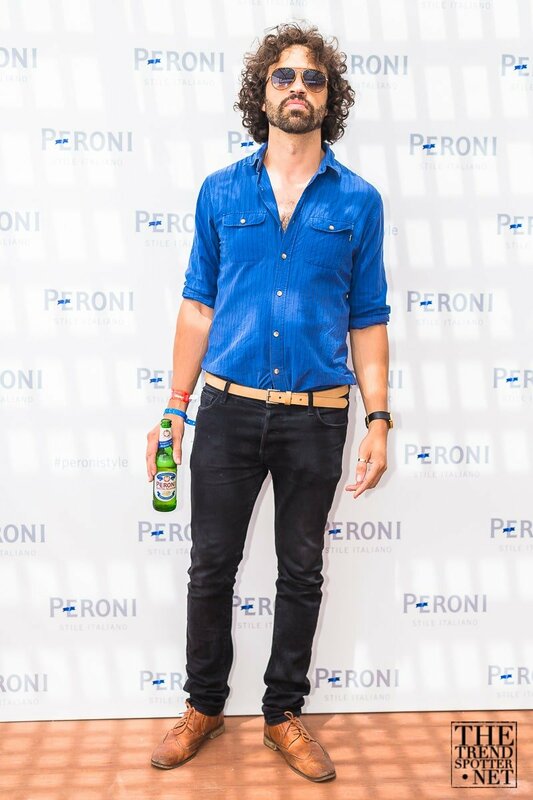 The Peroni Marquee was brimful with bright young things with many traversing between the two storeys of the Italianate garden compete with terrace balcony and sweeping grand staircase. Frenziedly socialising and catching up on post-holiday news were, Nick Smith of NewsLifeMedia, model Emily Baker wowing the fashion pundits in the latest season Gucci, Dene Heath of men’s accessories distributors Ransal, Nine Network’s Catriona Rowntree, Lindy Klim, Brent de Boer from the Dandy Warhols and Immigrant Union publicists Kate Keane and Kate Bensimon of Kate & Co. Peroni’s guest list of social luminary sorts was created by marketing agency, 3 Degrees. Much festivity was also witnessed in the VRC Young Members Moroccan inspired marquee whose guests included Bachelorette to be Laurina Fleure, Liz Cambage, Rhys Urlich, Rebecca Judd in a lace playsuit, Rebeccah Panozza and the VRC’s PR and Social Media Executive Matthew Ongarello. Also at the social forefront, the Genovese Shots enclosure hosted by the effervescent Eleonora Genovese and the Amuk Marquee where the fashions were bright, the guest spiritedly ebullient and the music thumping. As for the fashions, though the weather forecast had been ominous, nothing could dampen the spirits of attendees to look their best. Sensible dressing ruled over ostentation and many attempted to allay the grey of the skies by attending in colour. For the lasses these included an array of summer pastels, though many favoured the crispness of white-on-white or the sharpness of white-on-black. Full skirts or wide legged tailored pants seemed much favoured worn with cropped tops, casual unstructured jackets or light capes. In keeping with the need to traverse fields, wedges, smart ballerina flats and even a steady stream of designer Wellington boots made their appearance. The lads arrived looking satirically splendid in summer wight jackets, light summer knits, smart cotton shirts and coloured or patterned chinos or shorts. Our dapper lads opting for boating shoes and smart loafers as their chosen shoes. With panache, many of the lads bravely mixed textures and patterns showing an increasing trend for experimenting rather than safe options when it comes to menswear. Olympia Valance of hit TV show Neighbours wears silk top and maxi by Flannel, vintage Chanel straw clutch and vintage jewellery. International social darling Lady Susan Renouf, makes a much anticipated return to the party scene. 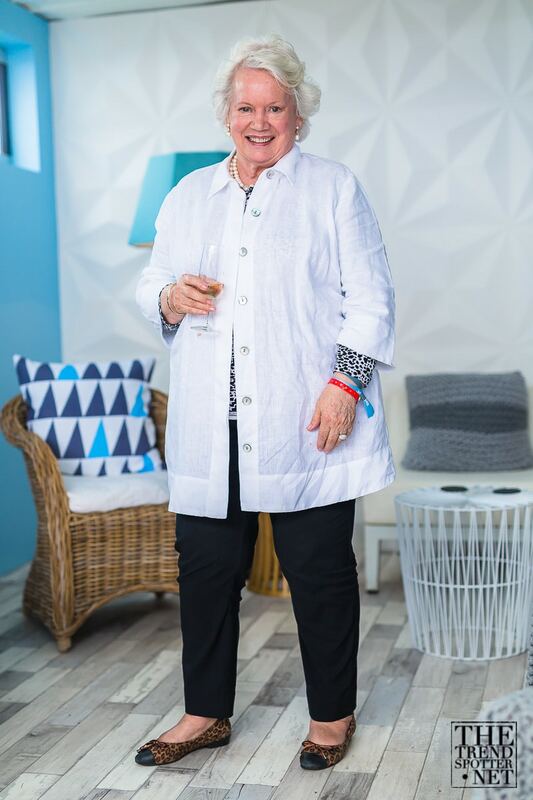 Lady Renouf looking resort chic in crisp linen and a coterie of South Sea pearl jewellery. 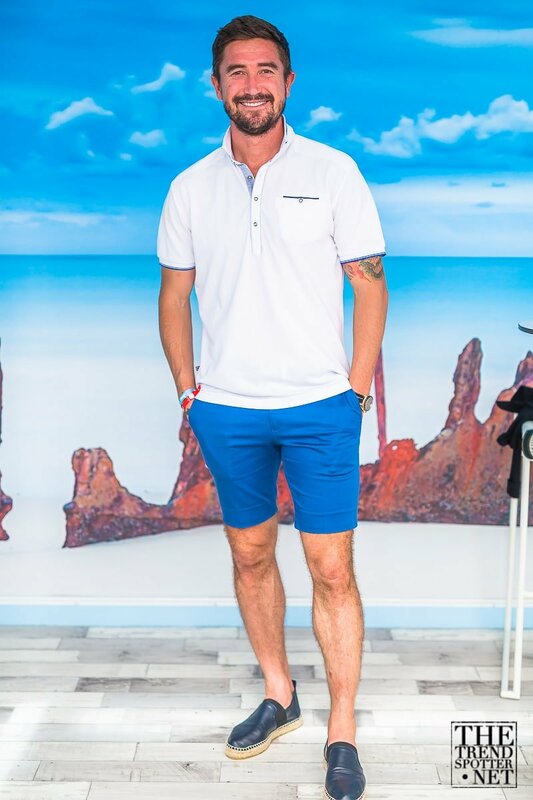 Ace soccer player Harry Kewell wears Politix and leather espadrilles by Balenciaga. Lydia Schiavello who is set to appear in the second season of much talked about reality show, The Real Housewives of Melbourne wears a peplum jacket and skirt by Melbourne label Scanlan and Theodore with Dolce and Gabbana shoes. 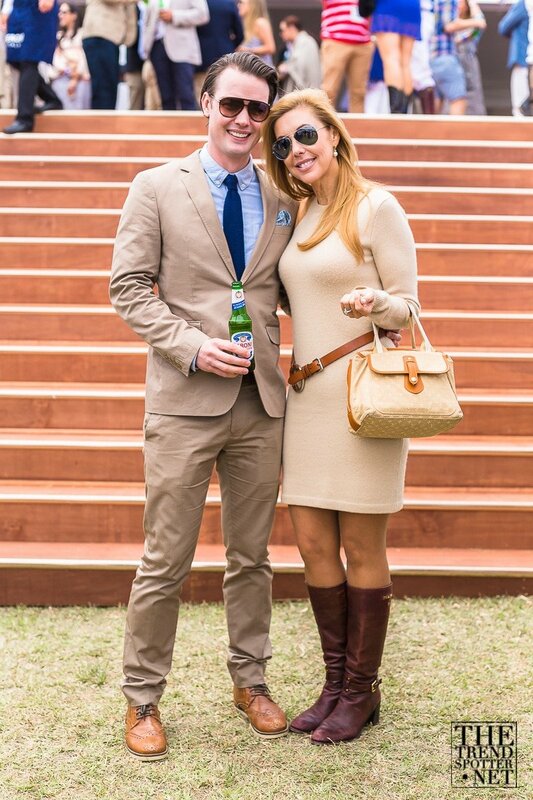 Schiavello is seen with socialite and philanthropist Coral Knowles who wears a selection of designer garments bought on overseas holidays. Media Personality Brynne Edelsten festively in all white in her upcoming fashion venture, Mia Sophia. 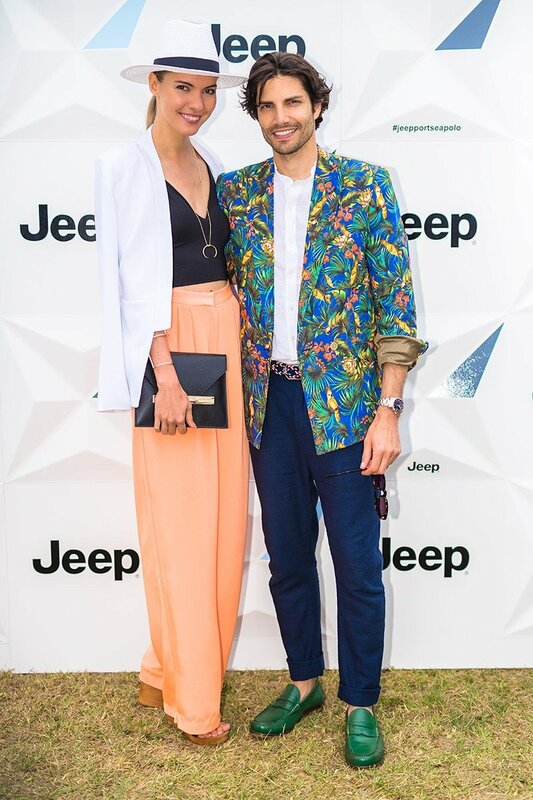 TheTrendSpotter’s Dasha and Colin Gold, the Jeep Portsea Polo’s very first Official Bloggers. Dasha ethereally chic in Kookai whilst Collin is dressed by Clemente Talarico, loafers by Bared Footwear and sports a steel and rose gold Longines watch. Danielle Vagner, queen bee at Kookai, shows effortless style in Kookai. Janet Roach another of our famous RHOM housewives, leads the pack of damsels who blazed colour in her orange sleeveless dress which revealed her trim figure. Roach obliged her many adoring fans posing for photos with them. 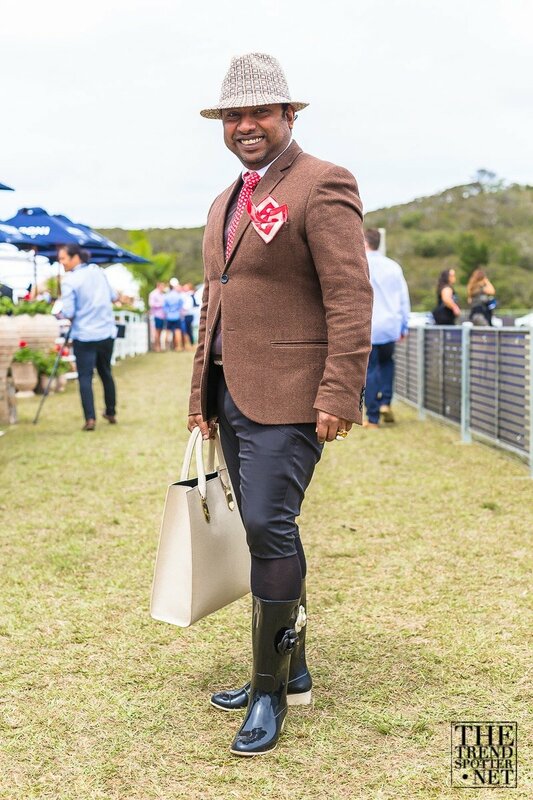 VAMFF Partnerships Executive and The TrendSpotters occasional contributors opts for bucolic style in English Tweed and weather appropriate Chanel Wellington boots with bag by Kookai. 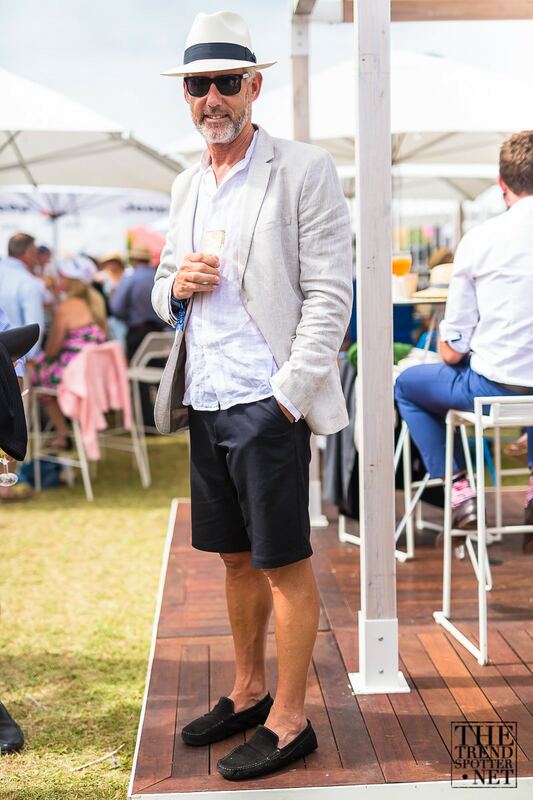 Alan Nelson, man about town and responsible for the distribution of Australia’s seemingly favourite champagne, Laurent Perrier, sports relaxed summer style. 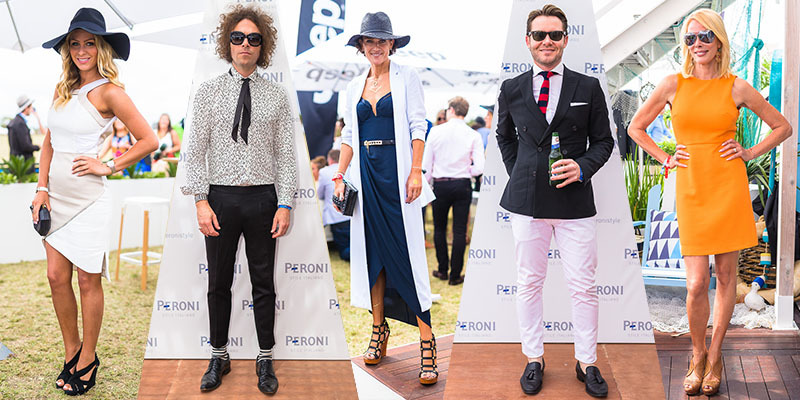 Sydney style queens bluster into Portsea for a day of turf-side merriment in black and white glamour. Tash Sefton of blog, They All Hate Us, wears an Ellery skirt, Scanlan and Theodore shirt with Valentino flats and classic Chanel 2.55. Roxy Jacenko of PR and Events supreme at Sweaty Betty PR wears a Scanlan and Theodore skirt with Bassike T.
YSL toting Lana Wilkinson, looking extraordinarily bright in tangerine, cosies up to recently engaged Whitney Port who wears Toni Maticevski. 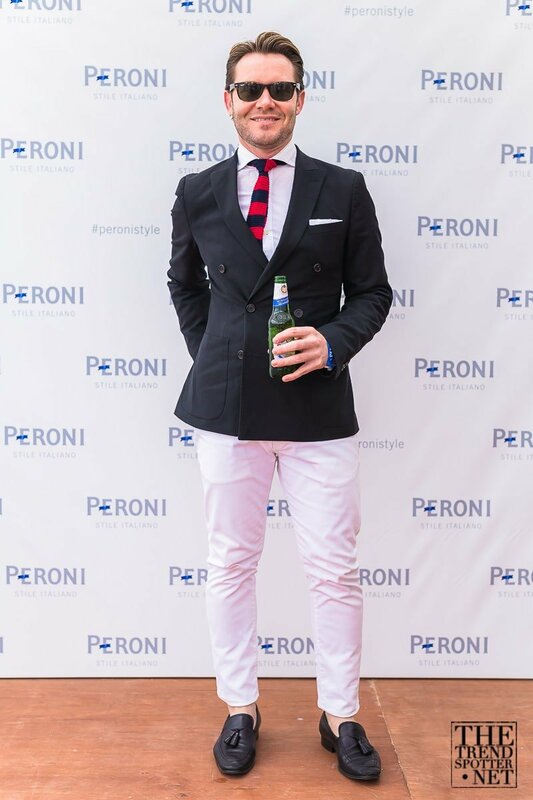 Fashion designer and TV reality star Port arrived for the Portsea Polo hijinks with fiancé Tim Roseman. Port’s engagement ring was designed and created by jeweller to the jet set, Melbourne’s own Ron Bensimon. Model Emily Baker looking quite the style siren in current season Gucci. NewsLifeMedia’s Nick Smith looking quite the GQ man. Smith wears Ralph Lauren with Prada tasselled loafers. Birds of a feather……looking chic in top to toe black Eva Scolaro wears vintage YSL whilst Lindy Klim favours Ellery and Mawi jewellery. 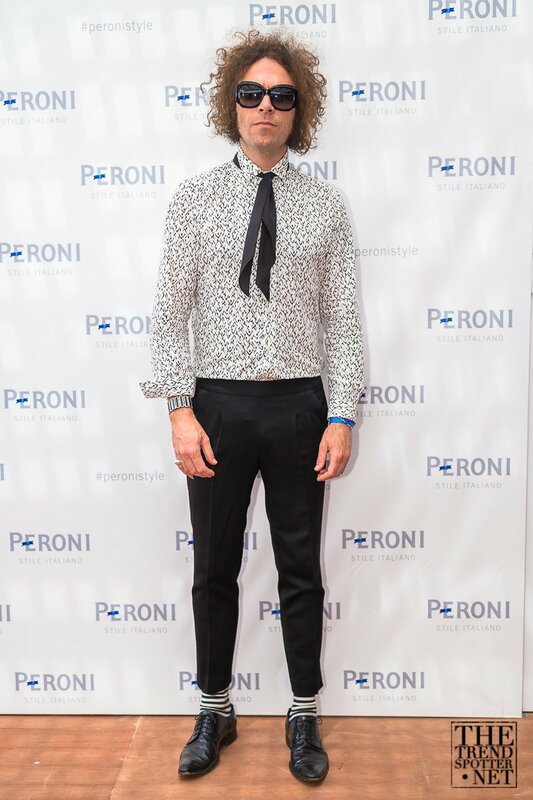 Oregon born singer-song writer Brent De Boer of The Dandy Warhols and Immigrant Union looks quite the modern dandy in shirt by Jack London, pants by Yeojin Bae, Dolce & Gabbana shoes accessorised with Dinosaur Designs bracelet. Dene Heath and David McCartney both wear GANT Rugger. 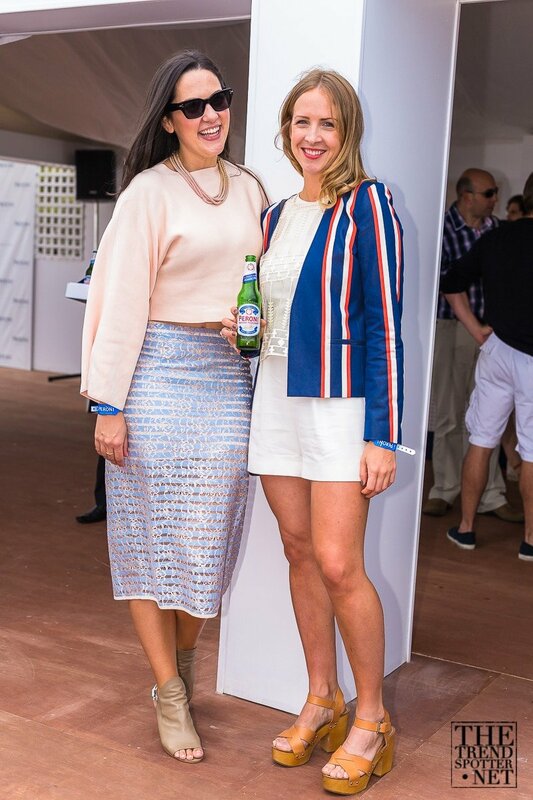 The Peroni team who graciously doled out exemplary hospitality. Bridie Wallas wears Zara whilst Amy Kearney is head to toe in Sass and Bide. More rocker style as exhibited by True Live’s Ryan Ritchie in Supreme, Lee Jeans, The Horse shoes and Lozza sunglasses. Sydney-sider Marcus Ross wears P.Johnson Tailors whilst the Nine Network’s Catriona Rowntree also opts for Ralph Lauren and Prada boots. WAG Rebeccah Panozza wears White Suede and a Longines timepiece.